As with many other books and films in the noir genre this book opens with a mysterious beautiful woman in need of help. In this case the woman is Ms Wonderly. She enlists detective Sam Spade and his partner Miles Archer to help track down her sister who was last seen in San Francisco with a violent thug named Thursby. Eventually it comes to Sam to navigate a web of secrets and lies to find the object at the heart of this mystery… the black bird. I enjoy noir so I picked up The Maltese Falcon. I’ve had it in my library for quite some time patiently waiting for a cool rainy spring night to kick back and enjoy a good story. I liked this book. At 8 hours it’s a relatively quick listen. I’ve actually finished it three times in the past month. 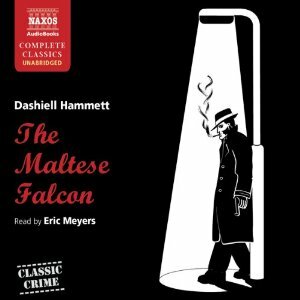 There aren’t a whole lot of events that transpire over the course of the book, but Dashiell Hammett really spent a lot of time fleshing out the characters via descriptions of appearance and mannerisms, and excellent dialogue. Narrator Eric Meyers did a fantastic job bringing the characters to life. The variety, quality, and execution of the voices are spot on with the descriptions. There are moments where Sam’s interactions with the female characters could be viewed as less than flattering by those sensitive to issues of sexism and misogyny. To me this is a separate and more involved discussion irrelevant to the issue of whether I would recommend it or not. It’s there. It’s authentic to the time (this book was written in the 30’s.) It’s minor. Beyond that, the worst thing that I can say about this book is that if you are expecting shootouts and fistfights then you will be disappointed. If you are the type that enjoys a good mystery then I think that this audio book is worth trying. If you prefer more action with your sleuthing (and don’t mind a little supernatural content) then try The Dresden Files. If you want to try something written by a woman and from a woman’s perspective then take a look a my thoughts on Skinwalker.